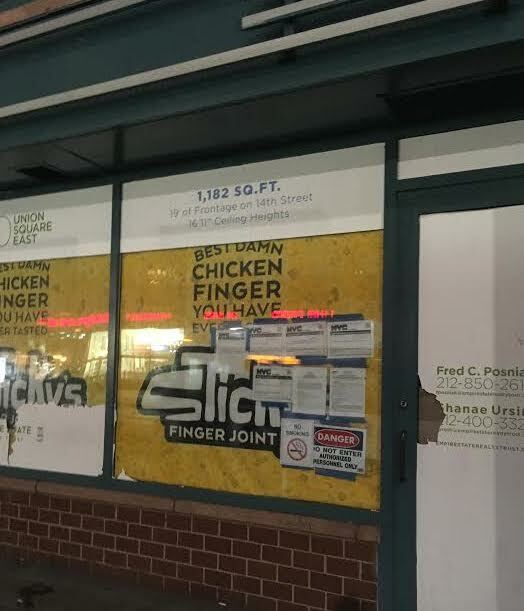 A new outpost of Sticky's Finger Joint — "New York City's finest gourmet Chicken Finger restaurant" — is opening in a retail space in the Zeckendorf Towers along 14th Street between Irving Place and Fourth Avenue. EVG regular Pinch, who shared the above photo, believes this space was previously a GameStop (which moved to another storefront a block or so away). This will mark the fifth Sticky's location in NYC. "Gourmet chicken fingers". Wow, remember when New York was a city for adults? Oh the irony, the Zeckendorf's commercial ground floor is pretty much fast food chains while the Mt Sinai medical offices fill the 2-5th floors. Put on my adult diaper and grab my baby rattle.... Get some chicken fingers and cereal. Afterwards, perhaps go to the 13th step! I'm a fan of their first outpost in the West Village. They have great boneless fried chicken with some creative, tasty sauces. What's not to like? Also, my girlfriend visited the Kellog's store this weekend and had a blast. For $6 they also send you off with a HUGE box of cereal (in addition to all-you-can-eat cereal toppings in the store). Good times! We ARE in Kansas everybody.